MAD MAX: FURY ROAD is just... well mad... It's a feature length action packed car chase weaved through a relatively basic, but powerful plot. Right from the start I was at the edge of my seat, straight away invested in where Max's journey would take him. Before I begin bringing up any negative points, I must make it clear that these issues are relatively small among the grand scale of cinematic art that this feature is. The driving action, cinematography, stunts and interesting characters will make this an instant DVD purchase for me. Some people online are both negatively and positively saying that Charlize Theron's 'Furiosa' character is more of a main character than Tom Hardy's 'Max' (Unlike previous films). I would argue that both of these were equal main characters in both heroics and screen time. It's just that it was Furiosa's story that was being told. In fact, I would have preferred more of Furiosa's backstory revealed as it seemed to only scratch the surface. But for what it was, great performance from Charlize Theron. 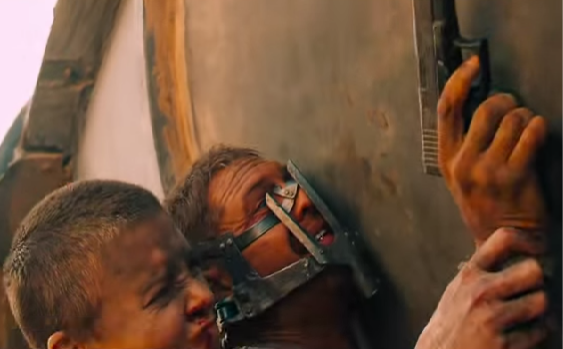 One of my favourite scenes is when Furiosa attempts to kill Max. I absolutely love the way Max was written into this film. Beginning with him as an incidental part of a much bigger event. Working his way in, to be an integral part of the plot a little further into the script. It kept me anxious, watching how he was to become involved and how he would escape. Tom Hardy's physical performance is excellent. His subtle hand gestures and facial expressions speak perfectly for Max's character. Unfortunately, there were quite a few moments that Tom Hardy began talking a bit like BANE. Clearer speaking please Tom, I have no idea what you're saying. Nicholas Hoult's character 'Nux' was another brilliant highlight. The performance is both insane and thoughtful. His character ends up being the most human and relatable one on screen. It's the quality in writing of characters like Nux and Furiosa that I feel, separate the original trilogy from FURY ROAD. Before I conclude I wanted to throw in some nitpicks. For one, the leads come across a tribe in the desert. They have obviously been there a while and had to leave a previously destroyed home. This tribe appear to be surviving in the desert, with their own security setup as well. But when they are asked where home is, they say there is none. Then how can they be surviving in the desert? Where do they find water and shelter? Where do they keep their bikes? Do they just sit in the sand all day? Also the film does not give too much time to really flesh out these tribe characters either but they're still involved in some awesome action scenes. Oh yeah, action scenes... you may need to press pause and go for a milkshake and a sleep (Or whatever you do to relax) before continuing when you get this on DVD. There was a flame thrower guitar player dude that seemed to me a bit Brutal Legend and it was awesome. MAD MAX: FURY ROAD. You won't have seen a film quite like this one, and you probably won't for a while. The action is 10/10 and there is enough great plot in there for the viewer to be fully invested.